The fresh faced kid with the Christmas glow in her eyes is me. It was Christmas morning 1967. Each year Santa gave me a doll. But, not just any doll. I only wanted dolls that did something. This doll is Tippy Toes. 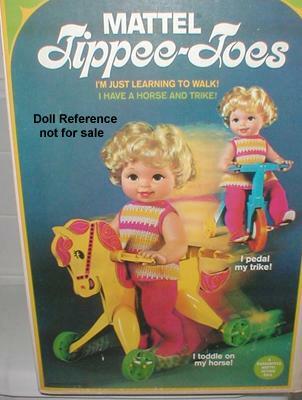 She could ride a bicycle, scoot on her horse, and she was learning to walk. What a doll! What great gifts! They make me SMILE, as well! With three daughters, we had lots of dolls “that did things” on Christmas morning… and the rest of the year as well!